Although Niger is facing a severe food crisis, early large-scale responses have so far helped prevent a rapid deterioration in the nutritional state of children. "We managed to avoid the worst until now," said the coordinator of Niger's early warning system, Harouna Hamani. "Even though the population is suffering and rates of malnutrition are very high, it could have been catastrophic without early interventions." Almost 17 percent of under-five children are malnourished and nearly half of Niger's 15.2 million people are at risk of hunger after harvests failed in 2009, the government said. Distributions of fortified flour, oil and sugar to children under two years old, backed by the UN and several NGOs, have been taking place since May in areas where rates of acute malnutrition are above the emergency threshold of 15 percent set by the World Health Organization (WHO). The supplementary rations are meant to prevent more children from becoming malnourished, said Rachid Boumnijel, food security manager for Irish NGO Concern in Tahoua region, central Niger. The NGO has also focused on strengthening the capacity of 10,000 families to cope with the crisis and feed their children by giving them cash and, in some cases, seeds, and on treating malnutrition. Since April, Concern's team of 330 volunteers has been dispatched to villages in Tahoua and Illela departments, in Tahoua region, to find children with signs of malnutrition and refer them to the nearest medical facility. "We started as soon as we saw that the situation was going to be difficult," said Boumnijel. "Our goal was to limit the number of cases of severely malnourished children, and we have been able to keep the situation under control." 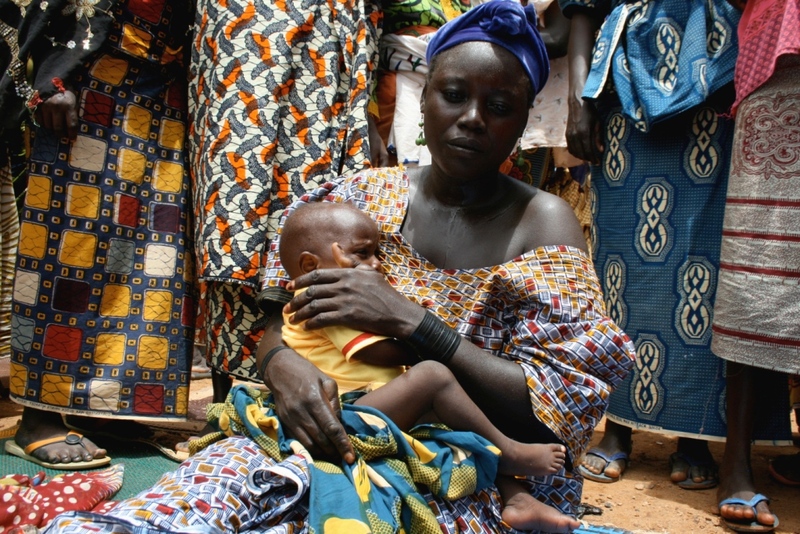 The organization has been supporting the treatment of acute malnutrition in several health centres, and a recent survey indicated that prevalence of this condition in the area Concern covers is now below WHO's emergency threshold. "The situation this year is much worse than in 2005, but the response is much better," said Eric-Alain Ategbo, nutrition manager at the UN Children's Fund (UNICEF). "Since then, efforts have been made to increase the capacity of national structures. Now Niger is one of the countries on the continent with the highest number of facilities for the treatment of malnutrition." Clinics have treated nearly 150,000 severely malnourished children since the beginning of 2010, and 6,000 to 7,000 new cases are reported every week, according to the UN. Yet this positive picture is not always consistent, nor is access to quality healthcare and assistance. Saratou Mahamadou had to walk for half a day with severely malnourished 16-month-old Rachida on her back to reach the health centre in Moghem village, in Tahoua region. "Only 44 percent of the population lives within a distance of 10 km or less from a health centre," said Adamou Oussemi, regional director of public health in Tahoua. He noted that outreach efforts in districts not supported by an NGO were inadequate. "The number of cases increases when there is a partner [organization supporting the public structures], since an active identification [of malnourished children] takes place. Elsewhere, children may die at home - if they don't come to the hospital, we have no way of knowing." UNICEF's public health consultant in Tahoua, Pacifique Kitanina Fuoto, said more than a third of the region's health centres were not receiving such support and had limited capacity. Pockets of insecurity are also limiting the ability of NGOs to assess and respond to needs, said Modibo Traoré, head of the Office for the Coordination of Humanitarian Affairs in Niger. "Movements are limited in northern Tahoua, Tillaberi and Agadez regions. Areas may be left out, which has an impact on the quality of care offered." Underestimations by the government and the UN mean not all disadvantaged infants received supplementary rations, but the number of children has now been revised from half a million to more than 900,000, said UNICEF's Ategbo. In Bagga village, home to 5,000 people, only 100 of the many children in need of help received the ration. "In the end, we had to do a draw to select them," said its chief, Idrissa Dayabou. Analysis: What is a famine? Tahoua Public Health director Oussemi warned that the situation could worsen, as malnutrition usually peaked in August and September, before the harvest. The start of the rainy season – when families begin planting - could lead to a deterioration of the nutritional state of children, because parents were likely to wait for longer before seeking medical care, said Manuel Lopez Iglesias, head of mission at Médecins Sans Frontières-Spain, which works in two departments in Tahoua. "People think malnutrition is normal and tend to wait until a child is really sick," he said. "We have to push people to go to health centres, especially when they are busy cultivating their fields."